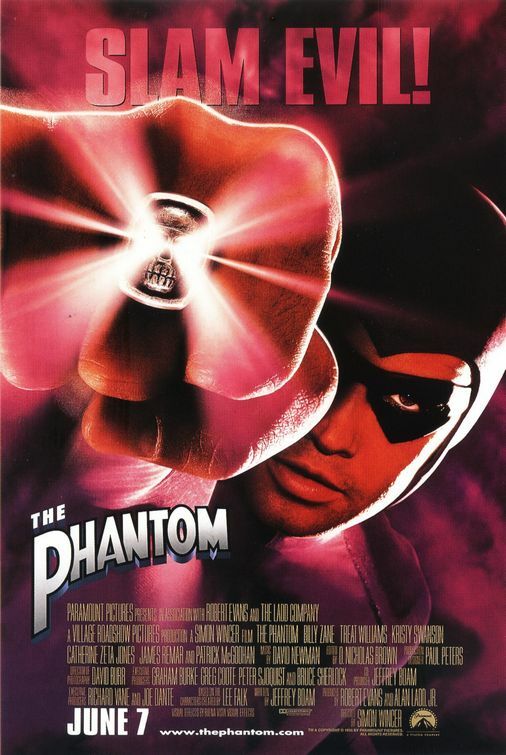 ​The Phantom is a 1996 American superhero film directed by Simon Wincer. The film stars Billy Zane as a seemingly immortal crimefighter and his battle against all forms of evil. The Phantom also stars Treat Williams, Kristy Swanson, Catherine Zeta-Jones, James Remar and Patrick McGoohan. The Phantom Movie Prop Peplicas, Figures, Toys and Collectibles! The modern Phantom is the 21st of the line. Since 1936, he's been the law in his dangerous corner of the world: a one-man police force, a silent avenger who appears and vanishes like lightning! His unmistakable ring is recreated here in his honor. With the opposing (good) seal on either side, the Phantom Ring of Evil Replica is precisely fashioned of silver alloy. It includes a certificate of authenticity and arrives in a purple display box. 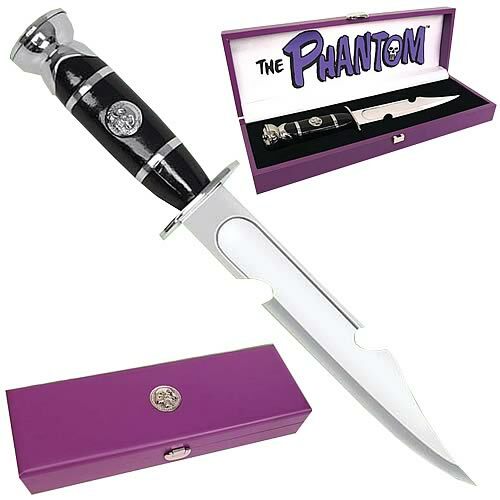 Order yours before it, like The Phantom, disappears! Available only in men's size 12. 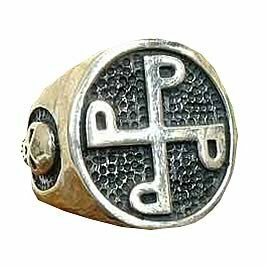 This authentic Phantom Ring of Good Replica is exactingly reproduced in a silver alloy, emblazoned with the opposing (evil) seal on either side. It comes in its own purple collector's display box with a certificate of authenticity, and is available in men's size 12. Take 'The Oath of the Skull,' devote your life to the destruction of injustice, and wear this noble ring with pride! Comics' 1st masked-mystery-man hero had been striking fear into the dark hearts of the wicked long before Batman, before The Shadow, before The Green Hornet, and before The Lone Ranger. Indeed, by the time the world-famous adventures of The Phantom were 1st recorded in print more than 6 decades ago, the grim champion of justice had already been around for nearly 400 years! Through the years, The Phantom has become efficient with many weapons and forms of fighting, but his weapons of choice are his custom 1911 Colts. 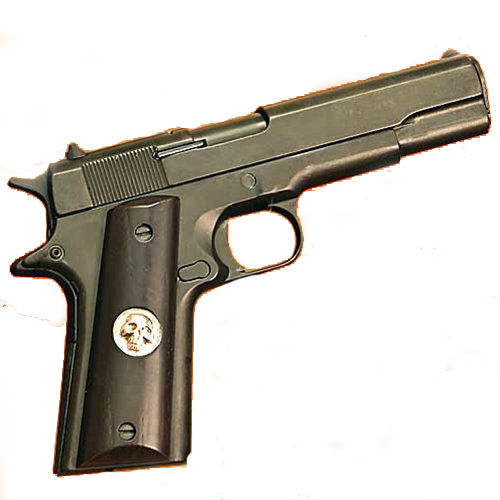 These officially licensed, non firing full metal guns are functional in every way; the magazine ejects, the barrel slides and the trigger pulls. The custom hardwood, black grips are inset with metal medallions of the symbols from the two famous rings he wears. A full color display rack, which can be hung on a wall or stand freely on a shelf, along with a numbered Certificate of Authenticity is included. Made by Windlass Steelcrafts and the KIMAR gun factory of Italy. Officially licensed by King Features, these are strictly limited to only 250 each worldwide. For the first time ever, get this fully licensed jungle knife of "The Ghost Who Walks"! Celebrating the 70th anniversary of this legendary figure that started the hero genre, The Phantom's Bowie style knife features a hand forged, high carbon steel blade with full tang for strength. Nickel-plated full metal parts and real wood grip with lacquer to prevent rot in the jungle. Includes custom display box with metal accent. Measures approximately 13-inches long. In the jungles of the fictional African country of Bangalla there is a myth featuring The Ghost Who Walks, a powerful and indestructible guardian of the innocent and fighter of all types of injustice. Because he seems to have existed for generations, many believe him to be immortal. In reality, the Phantom is a legacy hero, descended from 20 previous generations of crimefighters who all adopt the same persona. When a new Phantom takes the task from his dying father, he swears the Oath of the Skull: "I swear to devote my life to the destruction of piracy, greed, cruelty, and injustice, in all their forms, and my sons and their sons shall follow me". The first Phantom married Christina, the daughter of a Scandinavian sea captain, Eric the Rover. The second Phantom married Marabella, the granddaughter of Christopher Columbus. A signature of the character is his two rings. One has a pattern formed like four crossing sabres, "The Good Mark", that he leaves on visitors whom he befriends, placing the person under his protection. The other, "The Evil Mark" or "Skull Mark" has a skull shape, which leaves a scar of the corresponding shape on the enemies he punches with it. He wears the Good Mark on his left hand because it is closer to the heart, and the Evil Mark on his right hand. 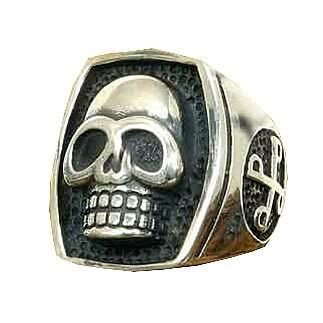 According to the Team Fantomen stories, the Skull Ring was given to the first Phantom by Paracelsus. The original owner of the Skull Ring was Emperor Nero of the Roman empire and it would later be revealed that the ring had been made from the nails that hung Jesus to the cross. The Good Mark ring was made after the sixth Phantom founded the Jungle Patrol.